Argentina looks to be the most ambitious of the three, aiming to become the world’s lithium superpower supplier at a time when the electric car revolution is about to boom. To highlight this fact, Shell has pushed further into EV charging, leading a $31 million investment in EV charging start-up Ample in a bid to provide ‘Electric Cars for Everyone’. Meanwhile, oil giant BP announced earlier in the year it would invest $20 million in an Israeli company that could allow an electric car to be charged in five minutes’. If large oil companies are getting in on the electric vehicle (EV) action, there has to be something to this revolution. Estimates from the International Energy Agency show the production of EVs will grow from three million to 125 million by 2030. Keeping that in mind, Argentina is a great place to be for an ASX-listed junior with a potentially company-changing lithium project. Today’s company has rights to earn a 100% interest in projects located in one of the most prolific salt flats in the Lithium Triangle. This $24 million capped company is fast tracking to lithium carbonate production and focusing its attentions on the Salar del Hombre Muerto in Argentina — a prolific region shown to contain high uniform concentrations of lithium combined with low levels of other contaminants, which is an enviable profile for a budding explorer or miner. Within the Salar del Hombre Muerto basin are brine-based deposits that hold high concentrations of lithium ranging from 200 to 2000 parts per million. It is one of the biggest lithium basins in the world. A further benefit for an explorer with strategic landholdings in this region is the brine’s typically low resistivity value. At this company’s primary project, the Candelas Project, previous CSAMT (Controlled-source Electromagnetics and Audio-frequency Magnetotellurics) resistivity surveys show encouraging brine potential. In fact, initial findings indicate that the grades at the project could be similar to those that Livent (NYSE:LTHM) is extracting at its adjacent Fenix operations. A word on LTHM. In October, the company listed on the NYSE raising US$340 million for a market capitalisation of US$2.43 billion. 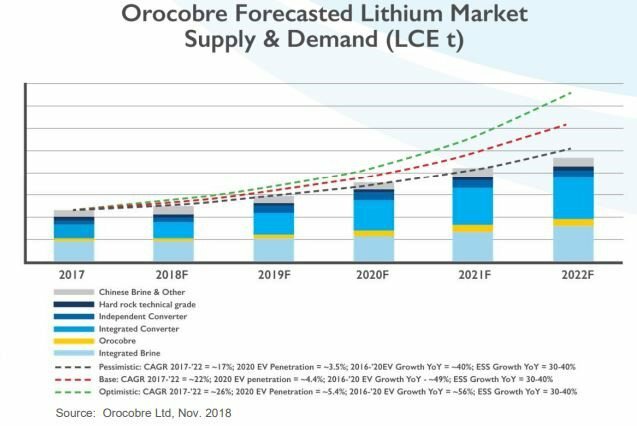 LTHM is FMC Corp’s lithium spin-off IPO on the strength of FMC’s lithium brine prospects in the enticing Salar del Hombre Muerto and is currently capped at US$2.8 billion. The company (FMC, now under LTHM’s umbrella) has been operating one of the lowest cost lithium mineral deposits in the world at the Salar del Hombre Muerto for over 20 years and its Fenix operation has the lowest impurity levels of any operating brine mine in the world. It has plans to expand its operations in the region further, attracting even more interest in the lithium-rich region. All of this suggests strongly that the region and geology is globally superior as far as lithium brines go. Another neighbour to today’s company is lithium miner Galaxy Resources (ASX:GXY) which is up 25% in the last month, having executed a deal with South Korean steel making company POSCO for the latter to purchase US$280 million worth of its Hombre Muerto tenements. The sheer size of that deal goes a long way to highlighting the worth of landholdings in the lithium-rich area. Clearly today’s lithium play is in good company being located in this particular Salar within South America’s lithium triangle. The most recent surveys conducted over key targets at the project indicated brines as deep as 600 metres down. However, this company’s project is yet to be fully appreciated, despite it being in a world class location, holding a potentially large resource in a proven high grade, low impurity setting and is being led by an experienced in-country team. Its newly acquired tenement package comprises six project areas totalling ~25,000 hectares with conservative estimates of brine coverage potentially pegged at ~7800 hectares. These assets are all within a setting that’s ideal for lithium brines. Toronto listed NRG Metals Inc. (TSX-V: NGZ) is also in the region and kicked off initial diamond drilling at its Hombre Muerto North lithium project earlier this year. Like, GLN, NGZ is adjacent to Galaxy’s and Livent’s landholdings. Livent’s producing Fenix lithium mine in Salar del Hombre Muerto is actually the largest producing lithium mine in Argentina. So at least some of the area’s potential has already been realised. But what proportion of its total Resources are currently accounted for, no one yet knows. GLN is aiming to find out. GLN believes there are strong signs that there’s plenty more lithium to be extracted at the Salar. The small cap is currently awaiting final permitting to conduct drilling over its new projects, which it expects to receive sometime this quarter. At the same time, it is advancing contracts for drilling and for the camp, OH&S, catering and general logistics. There is a lot going on here, but let’s take a more in-depth look at GLN’s flagship play — the Candelas project. The Candelas project covers more than 6000 hectares of potential brine reservoirs, with the Candelas channel lying within a structurally controlled ‘graben’ formed into basement pre-Cambrian metamorphic rocks, extending for the full 15 kilometre length of the project. The channel is filled with what’s known as tertiary ignimbrites, sourced from the nearby Cerro Galan volcano, as well as more recent pleistocene sediments (alluvial fan, channel and salar sediments). 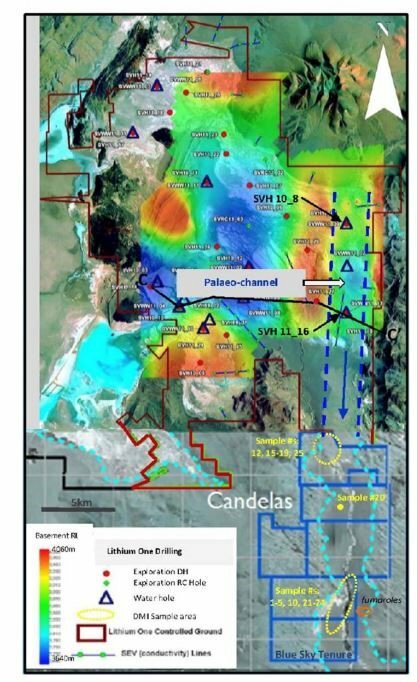 What’s most compelling about Candelas is the fact it is contiguous with Galaxy Resource’s high-value Sal de Vida lithium project. 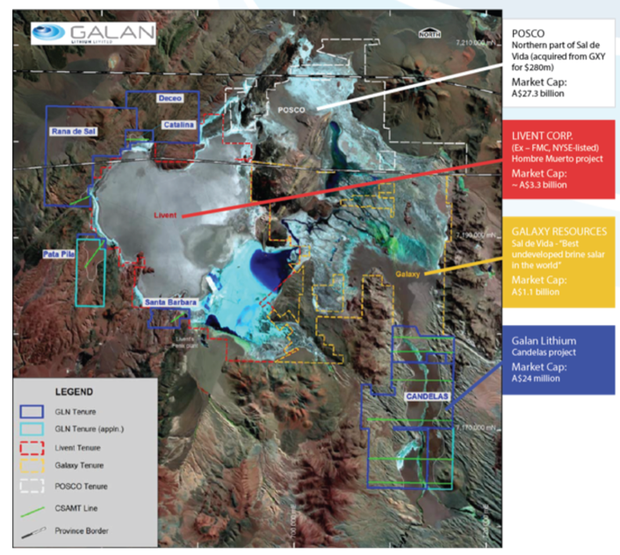 In May this year, Galaxy released an updated Feasibility Study supporting a low cost, long life lithium and potash operation at its Sal de Vida project, with an estimated post tax net present value of US$1.48 billion over a 40 year mine life. Capex was estimated at just US$474 million and ongoing expenses at US$3,144/t LCE. The economics are impressive for projects in this valuable, lithium-rich spot. Galaxy’s closest drilling to Candelas produced substantial volumes of brine similar to those thought to exist at Candelas, and indicated a perfect permeable host. GLN completed a follow up round of surveys at the project in October, which specifically Interpreted Gravity and CSAMT Resistivity surveys. The results supported the notion that the Candelas project has brine thicknesses interpreted to range from ~150 to 400 metres with the scale of the results far exceeding the company’s original expectations. The work was done by geophysical consultants Quantec Geoscience Ltd, who incidentally have previously conducted work at the neighbouring Sal de Vida project for Galaxy, so are familiar with the lithium hotspot. The CSAMT survey covered 25.6 line kilometres over six profiles, five of which were extensions to previously surveyed lines with one new line surveyed to extend strike coverage along the channel to the south. The first survey done earlier in the year was interpreted by GLN’s consultants as showing “...very conductive and shallow units that are compatible with units being saturated with brine”, which remained open laterally largely to the west. The recent surveys supported the findings of the first, indicating a good model of ‘subsurface resistivity’ at the project, and indicating that the conductive materials are more laterally extensive than previously expected. The project has huge potential with a 15 kilometre long by three kilometre wide by 150-400m thick target and maiden drilling is planned to commence before Christmas. If all goes to plan, GLN could have a serious lithium play in a country that has opened its doors to projects that could offer it an economic benefit. Much has been written about the highs and lows of Argentina and its economy. However, Argentina remains the richest country in Latin America when it comes to natural resources. In fact, in the late 1800s to early 1900s the country was at the same level as the US in terms of resource generation. However, due to corruption, poor economic management, dictatorships and ultra-nationalism etc, the opportunities have never been fully realised. In 2015, when Mauricio Macri was elected President the economic tide began to turn. Macri championed the opening of Argentina’s economy to international investment, dropped the fixed exchange rate and capital controls between the US$ and Argentine peso and dropped export duties and trade controls. Macri also recognised the power of ‘White Gold’ and since his time as President has championed major lithium project investments including POSCO’s purchase of SDV and Gangfeng’s acquisition of 50% of Cuachari-Olaroz for US$87.5 million. The following video sums up Argentina’s turnaround as well as its interest in lithium mining and exploration. As demand for lithium, especially lithium brines, increases, the salt flats of Chile, Bolivia and Argentina will become more and more important. Lithium brine projects generally boast several key benefits over the conventional hard rock lithium mining. One aspect that’s important to an ASX small cap like GLN is the potential for much lower capital expenditure (capex) and operational expenditure (opex). The operation tends to be simpler, with fewer steps needed to produce a Lithium Carbonate Equivalent (LCE). Smaller and more budget-conscious players operating in this space, and their shareholders, are now welcoming the creation of new processing methods which can reduce the time to produce LCE even further. Lithium brine operations are relatively simple with only a small number of steps required to produce lithium carbonate — which is what GLN is expecting to do. Here’s a look at the lithium carbonate production process. As mentioned, next door to GLN’s tenements is LTHM’s Fenix operation which has the lowest impurity levels of any operating brine mine in the world. It was a highly strategic decision to move into this region and it looks to be paying off. This includes a 127% spike in the three weeks (25 June to 16 July) following the company’s announcement of the Salar del Hombre Muertos acquisition. While the share price has pulled back some since then, it remains up 260% this year. In mid-October, GLN also got a bump on news of positive geophysical results which defined new discoveries over its western basin projects at the Salar. The targets were interpreted to contain conductive and shallow horizons ‘consistent with geological units saturated with brine’. The results increased the company’s total potential surface brine coverage by around 24% from 6000 hectares to 7800 hectares. The discovery and option to acquire the aforementioned assets come at a time when lithium is coming into peak demand. Most people would have come across the lithium story by now, if only indirectly through the rise of electric vehicles (EVs). The price of lithium has risen significantly in the past two years with the rise of EVs, with current prices sitting at approximately US$14,000/t LCE. Demand is set to continue to rise, which should put further upward pressure on prices. This is good news for producers, who are producing at <US$5000/t. Candelas isn’t the only project GLN is sitting on. It also has its western basin projects which resistivity surveys show are similar to the Candelas channel for lithium brine. Values from these targets lie adjacent to Livent’s operations. The resistivity surveys were completed over four new targets at Hombre Muerto salar and initial near surface water sampling is highly encouraging. A follow up CSMAT resistivity survey (below) has confirmed “very conductive and shallow horizons that are consistent with geological units that are saturated with brine”. Whilst these projects suggest positive implications for lithium grade potential, GLN will continue to primarily focus on Candelas. GLN provided an update on its options earlier this month, stating it had entered into an underwriting agreement with Barclay Wells Limited. The options are exercisable at $0.14 each and expire on 31 December. Compare that to its current share price of $0.27. The underwriting agreement covers 11,391,504 out of the company’s current quota of options on issue, 15,596,644. As such, the freshly announced agreement will guarantee that GLN receives at least $1,594,811 (before costs) to be used to advance its exploration activities at the Hombre Muerto Lithium Project located in Catamarca Province, Argentina. The underwriting not only provides some comfort for investors in terms of operational cash flow, but demonstrates considerable enthusiasm for its Candelas project, as well as its 25,000 hectare tenement package across the six project areas with Hombre Muerto. The company reported having A$918,000 in cash at the end of the September quarter — combined with the underwriting announced this month, GLN should end up with over $2 million to work with as it goes about securing the required permits to kick off drilling within the Hombre Muerto Salar. GLN has an experienced team to pick up and run with its newly acquired lithium assets. Chairman Nathan McMahon has over 25 years’ experience in tenement management and corporate advisory roles within the mining industry, and is joint MD of ASX listed explorer Cazaly Resources (ASX:CAZ). South American based Managing Director, Juan Pablo Vargas de la Vega, AKA ‘JP’, has 15 years’ experience in ASX listed mining companies, including BHP, Rio Tinto and Santos, and is using his experience and connections to run his own mining consulting business, ‘JP Mining’. Non-executive director Terry Gardiner has over 20 years’ stock market experience, and is also a current director of Cazaly, and brokerage firm Barclay Wells Ltd. This highly experienced in-country team is another notable asset of the company’s. GLN has its hands on a prime slice of real estate in Argentina’s prolific Salar del Hombre Muerto, and if permitting and drilling all go to plan, it could announce a Maiden Resource as early as the second half of next year. 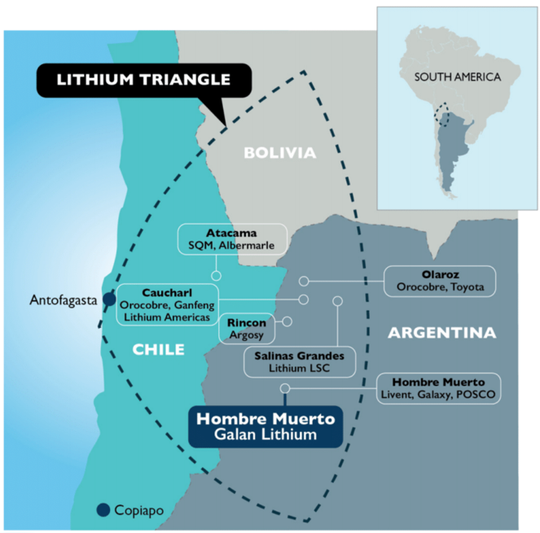 Brine deposits represent over 60% of global lithium resources, and much of the world’s known lithium brine resources are found in South America’s ‘lithium triangle’ where today’s junior has rights to purchase 100% of a sought-after lithium brine tenement package. 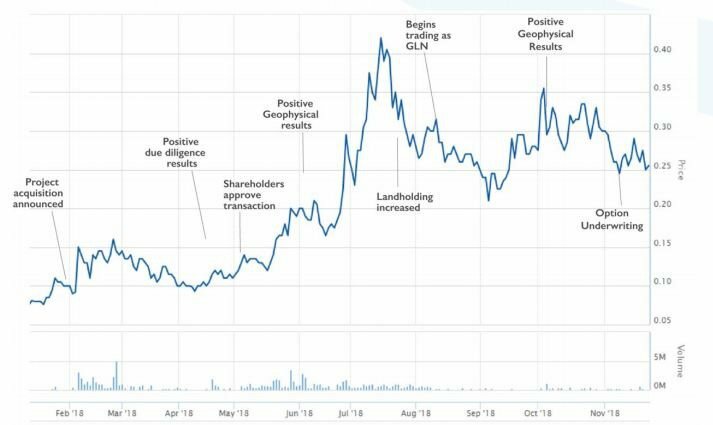 With several neighbours finding an abundance of lithium right next door to GLN, including major players Livent, Galaxy and POSCO, there is likely to be no shortage of news to potentially keep this small cap’s share price on the up and up.